The 10 Best Neighborhood Bars in Nebraska! In a state like Nebraska, with a hard-working and unpretentious attitude, it should come as no surprise that great local watering holes abound. These community haunts serve as a gathering space for you and your neighbors. For inexpensive drinks and hearty bar bites, check out the 10 best neighborhood bars in Nebraska! Located in the heart of Lincoln, the Zoo Bar is the ultimate neighborhood bar to catch live music with friends. Back in the day, this bar was visited by famous musicians such as Buddy Guy and Otis Rush and still hosts many talented acts today. Step into the Beercade in Omaha for a night of fun and games! With a wide variety of craft and local beers on tap as well as numerous retro arcade games and skeeball, there’s something for everyone at this laid back, fun local favorite. The Chicken Coops Sports Bar is a microbrewery sports bar in Grand Island that serves up tasty, delicious chicken wings along with an array of drink specials. Grab some friends and order up a basket of wings! The NoWhere bar in Lincoln is a fun neighborhood bar with pool tables, karaoke nights, and plenty of room for dancing. For a cozy, fun environment, head to Beer City in Omaha. Friday nights are dedicated to karaoke and there’s also free popcorn and peanuts flowing every night so you can enjoy a tasty snack with your beverage of choice. Make your way to Duffy’s Tavern in Lincoln for plenty of live music and fun. Both national and local musicians grace the stage at Duffy’s and you can catch a show almost every night of the week. For a great local bar and grill, Cunningham’s Journal is the spot. Located in Kearney, Cunningham’s offers plenty of seating, including an upper level, live music indoors and outdoors and some of the best bar food in the city. Jammer’s Pub has it all. 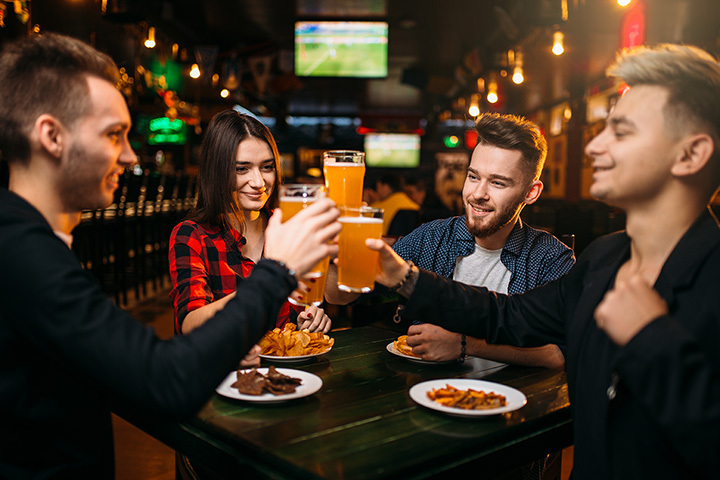 From a wide range of beer and drink specials to poker and parties, drop in to relax after a long day of work and hang out in this fun, friendly atmosphere. The Homy Inn is an Omaha classic hangout spot that serves up champagne, sangria, and much more amid vintage memorabilia and newspaper decor. Sluggers Bar & Grill in Grand Island is the perfect place to shoot some pool, watch a sporting event, and enjoy some drinks with friends. The great specials and tasty food can’t be beat. View more Nebraska Bars and Saloons.